Whether you're boxing, kickboxing or just burning calories on the heavy bag in your basement, your knuckles, hands and wrists are always at risk for injury when you punch. 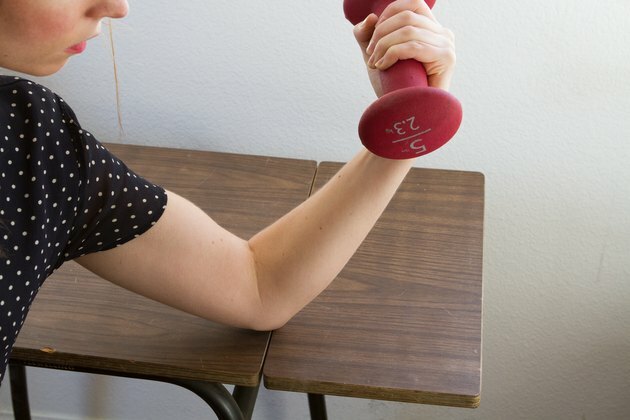 You can minimize this risk by performing exercises to strengthen your wrists. A stronger wrist will help to prevent acute injuries, but it will also keep your fist stable and aligned when you make contact with the bag. Flexion, extension and deviation exercises are simple to perform and should be part of your pre- and post-workout routine when it comes to punching. These exercises help to stretch out the tendons that run along your wrist and promote elasticity in the joint. Perform flexion and extension exercises by resting your wrist on a table with your hand hanging off the edge. Bend your wrist down and hold for five seconds. Return to the starting position, then bend your wrist up until a stretch is felt. Deviation involves bending your wrist to the left and right on the horizontal plane and holding the stretch. If you want to promote wrist strength while also training the muscles of your chest, back, shoulders and forearms, consider adding resistance to the equation. Pushups hit all of those areas at once, and you can train your wrists for punching by practicing pushups on your knuckles. You can also perform flexion, extension and deviation exercises with light dumbbells. Strengthening is important, but keeping the complex muscles and tendons involved in stabilizing your hand elastic is essential for preventing injuries. To focus on the stretch rather than the strengthening component of extension, flexion and deviation exercises, use your opposite hand to push and pull the targeted hand for a deep stretch. You can also work on supination and pronation by tucking your elbow into your side, keeping your hand straight out in front of you and then rotating your wrist clockwise and counter-clockwise. Stretching and strengthening will help you cut down on injuries, but until you build up some reactive fast-twitch muscle fibers, you're not going to be sure if your wrists can handle the impact of a hard punch. When you first start out, hit the speed bag and heavy bag with light punches. Ramp up the speed and power over time as your hands and wrists become conditioned to the repeated impact. Always wrap your hands and use boxing gloves when striking a target.